Here's Mark Tansey's ten-foot wide 1984 neo-conceptualist painting The Triumph of the New York School, which is roughly modeled on Velasquez's Surrender of Breda. It hangs in New York's Whitney Museum. 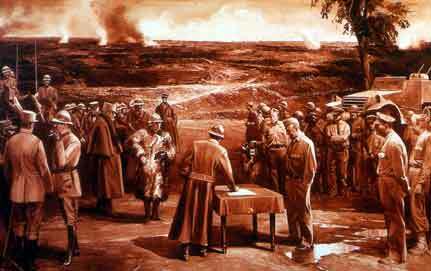 Tansey's painting shows defeated French artists (on the left) dressed in Great War uniforms signing the instruments of surrender of world art leadership to American critics and artists (on the right) dressed in casual WWII khaki. Surrealist writer Andre Breton, back to the viewer, is signing the surrender document while Duchamp, Matisse, and Picasso look on. The general of the victorious American forces, with his hands in his pockets, is critic Clement Greenberg, the chief expounder of Jackson Pollock's drip paintings. The second most dominant American figure is the MacArthuresque general on the right, critic Harold Rosenberg. In agreement with Tom Wolfe's 1975 book, The Painted Word , the actual American painters, such as Pollock, Willem de Kooning, and Mark Rothko, are depicted as adjutants in the background behind their critical leadership. The actual paintings themselves are a matter of personal taste, but there's no disputing the triumph of American art during the early Cold War years over stodgy Moscow-approved socialist realism as fashion. After WWII, the U.S. government attempted to win European intellectuals away from the Communist Party by sponsoring avant-garde art, such as the New York School of abstract expressionist painting. But, American politicians, such as President Truman, objected to the taxpayers dollars being wasted on ugly stuff that their kids could do. So, funding moved to the black budget of the CIA. Frances Stonor Saunders' 1995 article in The Independent, Modern art was CIA 'weapon,' revealed some details of CIA sponsorship of the New York School. Her method of research was basically to call up old CIA men (or their kids) and get them talking about their triumphs during the good old days. This is not a particularly reliable method (it invites old-timers to exaggerate their importance), but it's certainly better than nothing. This was the "long leash". The centrepiece of the CIA campaign became the Congress for Cultural Freedom, a vast jamboree of intellectuals, writers, historians, poets, and artists which was set up with CIA funds in 1950 and run by a CIA agent. It was the beach-head from which culture could be defended against the attacks of Moscow and its "fellow travellers" in the West. At its height, it had offices in 35 countries and published more than two dozen magazines, including Encounter [edited by English ex-Communist poet Stephen Spender]. Because Abstract Expressionism was expensive to move around and exhibit, millionaires and museums were called into play. Preeminent among these was Nelson Rockefeller, whose mother had co-founded the Museum of Modern Art in New York. 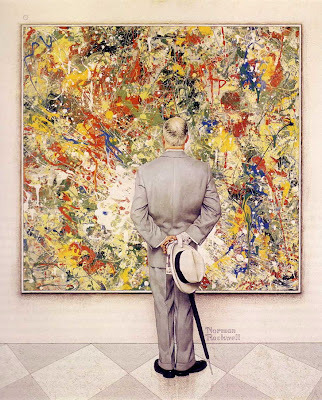 As president of what he called "Mummy's museum", Rockefeller was one of the biggest backers of Abstract Expressionism (which he called "free enterprise painting"). His museum was contracted to the Congress for Cultural Freedom to organise and curate most of its important art shows. Basically, this was the kind of painting that the American ruling class, circa 1945-1964, liked. Somebody with a lot of money and power caused this enormous canvas of drips to be displayed here. But why? What do they know that I don't know? If they can pull this off, what else can they do? What can't they do? They look like they are going to win, so wouldn't it be smarter for me just to go along with them? Abstract expressionism was a sort of objective correlative for the CIA.